Changed how the dateformat is read from “settings.dateFormat” to handle formats with four digit yyyy. 10.11.2012 Updated to v1.2 to add mouseover displaying days, hours and minutes. This update also includes the time portion of the “DueDate” in the calculation. Please note that the calculated column code must be changed if you want the time taken into account. 30.11.2011 I had a bug that made it work for grouped views only. This is fixed in v1.1. Only the code for the file “HighlightRowByDueDate.js” needs updating. Sorry for the inconvenience. The first solution i posted in this blog was the Compare DueDate with Today in list view. I have redone the solution and added support for SharePoint 2010 grouped views. I have NOT included the mouseover “overdue by” text. If there is a demand for it, i could add it back in. You put a CEWP below the list view web part. The actual code has been put in a separate file for use in multiple lists. The “function call” itself is placed in a CEWP below the list view web part. Download the code and put in a text-file and place it in a shares document library (all users must have read access), or in a folder created in SharePoint Designer. You should also put the CEWP-code in a text file in the same location and use the “Content Link” field in the “Edit web part” panel of the CEWP. This is most important in SharePoint 2010. You must change the “src” in the script tag referring the script “HighlightRowByDueDate.js” to reflect your local copy. greenDays: either an empty string ” to indicate “green for everything not yellow or red” or an integer (positive or negative) to indicate the “offset” to highlight green. greenColor: The image or text / HTML yo mark the items as “green”. yellowDays: The number of days (positive or negative) to offset the yellow marker. yellowColor: The image or text / HTML yo mark the items as “yellow”. redDays: The number of days (positive or negative) to offset the red marker. redColor: The image or text / HTML yo mark the items as “red”. 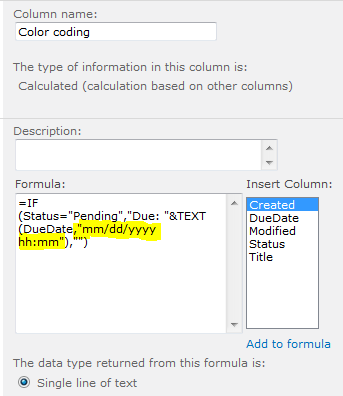 dateFormat: The date format used in your calculated column (see details below). identifierText: The lead-in text in the calculated column. This value is used to identify the cells to “treat”. replace: true or false – should the “image” replace the text in the cell, or prepend to the value. 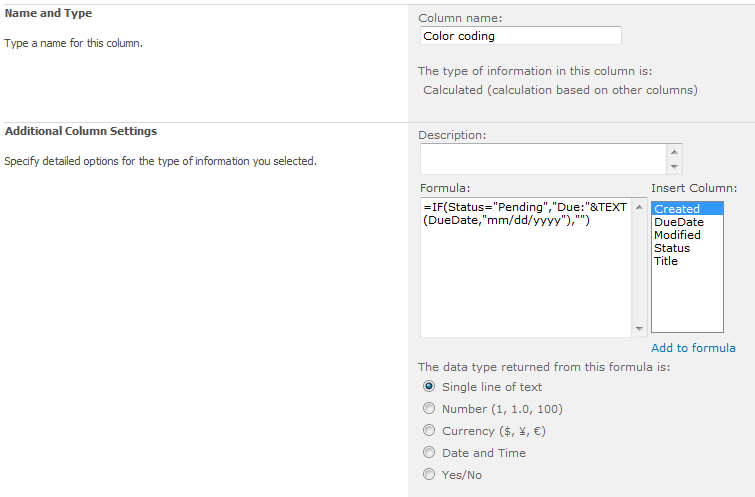 The “trigger” for the script is the lead in text in the calculated column – this text must match in the calculated column AND in the attribute “identifierText” in the settings object in the CEWP. Note: The calculated column must be in the view to make the solution work. I am a quiet Alexander Bautz fan. Thanks for the work you are doing. I work at an international children’s charity. Your charting and other code makes a big difference in presenting data to our decision makers. @Pat – I work for an NGO and tried to link up some NGO people working on SharePoint – tried to do that with twitter and other social media – but most told me they were willing to aswer my questions on the phone (as if I had any, I just wanted to connect) and did not see any value in a LinkedIn group or anything like that .. So here I try again – follow me on twitter @nicodejong and we can see from there. Alexander – thanks for letting me use your comments to connect with a potential peer. Trying this out, but having a problem. I am using WSS 3.0. I have added the js and CEWP code files to my usual location, updated the source links to point to my js file, added a calculated column to my task list and updated the formula to point to my Status & Due Date columns. Then added the CEWP and pointed the content link to the CEWP file. I get Due:30/11/11 in the “color coding” column but it doesn’t change it to the image. replace: is set to true and dateFormats match. Have you put the CEWP below the list view web part? Yep, same as all your other solutions. That worked. Alert popped up with “function”. Send me some screenshots of the setup (CEWP, calculated column and list view in edit mode). All my due date rows stay green, no matter what the date is. How can i check what is wrong? Hi, Ensure the date format in the CEWP code and the calculated column are the same. My solution was I had mm,dd,yyyy instead on mm/dd/yyyy just needed to update the , to /. Hope that helps in your solution. i had tried to find out the solution but struct, please help me in it. Could you please share you code? Are you supposed to add a “Color coding” field because I’m not getting any colors anywhere? 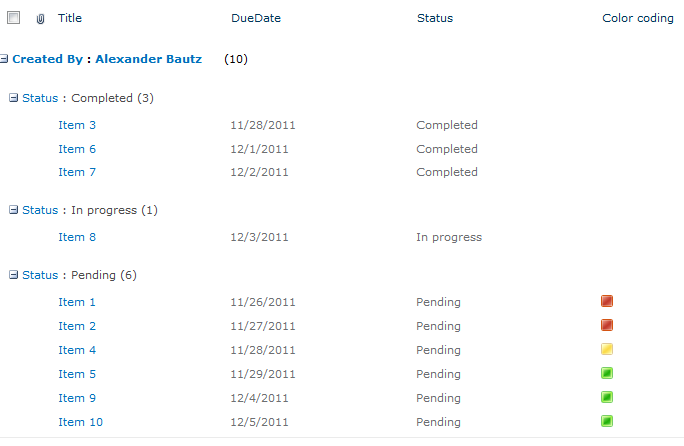 Just the duedate showing up as “Due: 8/9/2012” in my calculated field “Status”. Ok, so you are supposed to add a “color coding” field. My browser wasn’t showing that image. Sorry. However, I’m still not seeing any colors anywhere. Fantastic post, works like a charm. Thank you! I just have one question. I noticed that after a period of time viewing a page, the status icons revert to the Due:text. I have to refresh the page to get the icons back. Is this related to the timeout loop in the script? If so , what do I need to change to extend the timeout period? Does this happen if you do not touch the page? – or is it when you navigate around?. How do I get the HighlightRowByDueDate.js file? When I click the link, the only files in the folders are .txt files but when I click them it just opens up a blank screen. Right click the file and select “save target as”. In IE8 – I do not get the option to “Save Target As…”. Any way it can be saved in a Zip file? For now you can click the file, then right click the page and select view source. When doing that it just shows the same code you have above and references the HighlightRowByDueDate.txt file. Would it be possible to share the modified code? I would like to create a tasker with an indicator based on the number of days before it is due as well. Thank you so much for any help you can provide. The code is updated with support for the time portion of the date, and I have added mouseover with days, hours and minutes. Thanks a lot for your smart code. Nevertheless, I have a little problem. I no longer have access to “List tools” to access the Datasheet view for example. It seems that there is a conflict between JQuery and MS Ajax, but not sure. I’ve done my best in attempting to recreate the identical list with corresponding folders and .png (layouts, images, imnon.png, etc. ), as a TEST. What I have managed to create is a list that displays a date (for example – “Due:12/25/2012”), mimicking the actual content of the DueDate column. There is no image displayed. Despite hiding the CEWP, it still displays on the site. Thanks it is working, for the most part, with only one issue to resolve. I still have the following appearing on the page below the list. Not entirely sure why. I have applied, what I thought were remedies but no success. It is custom indicator column, no code required. Brill post but I am having a few issues – I have followed all the instructions and it is still not working! I have added the alert as per the comment above and I get the alert when I run the code outside of sharepoint but not inside. thank you for you solution. I’ve gor the similar as Dan in 2013. After setting a filter in any colmn in the current view the indicators disapears and the “Due: …” context appears. After deleting the filter and refreshing the site the colored indicators are back. This is NOT tested and there is no guarantee it will work. Seems to work. I will give you feedback after my tests. Is this a refresh or something like that? Yes, this is a “refresh” of the script when the URL changes (the part after the #). The check is done every 500 milliseconds, but the script is only refreshed when the filter is changed. I need some help regarding the sharepoint development, i am not aware of java coding, but i need a page where it would pop up a message or send automatic mails when the deadlines are close to the delivery dates also i need the same for software licenses, wherein it pops and indicates the expiry dates. Can you help me out ? ?